At the time I really though this would be the one, but in retrospect I did get unreasonably lucky in some places. I don't see myself topping this one for a while. Congratulations to @Caithness for becoming the first western Big Mode GM. You are the third fourth known player to do it along with SQR and SAL (edit: and jin8 ). What about Jin? SAL said that, besides him and I, the only other person he knew of who had achieved it was Jin (at the time that my GM was achieved). So that would make Caithness the "official" 4th person - which is still an extremely prestigious accomplishment! 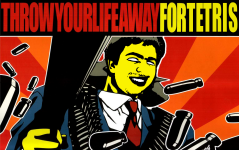 I was not aware that he had it! I asked SQR about it and he said that he had only known himself and SAL to have it. Yep, SAL's exact quote was "The 1st is jin8"
Sorry, that was my misunderstanding. After that I asked jin8 and he replied that he did not achieve it. I heard that someone has already cleared when I achieved it, but now I do not know who it was. Shuey and JBroms like this. Got 862 big+20G in nullpo today. Have had several over 500 recently so I think the GM will come soon. Some folks in KevinDDR's twitch chat said I should post it here. Qlex and Shuey like this. Yeah, nullpo has some actual differences in big mode, not really a fan but it's all I've got at the moment. A proper TGM setup would help a lot! I definitely know it's not the same, but I've never seen anyone else get a Big Mode GM in Nullpomino Grade Mania Classic, so it meant a lot to me when I got it . I think the only reason people discounted it is because a Big game in Nullpo has the potential to be anywhere from half to ~3/4ths as many levels as a real game because you get 6 or 8 levels for a triple or a Tetris. Still huge but obviously can't be compared with a real TGM1 Big GM, although it's not that much easier. Nice job to both of you of course! Well said Kevin. It's definitely different and not the same as a full-fledged TGM Big Mode GM. Now if I could just get myself motivated enough to put together a full TGM setup (where I can effectively record it as well), I could actually start working towards an official GM . 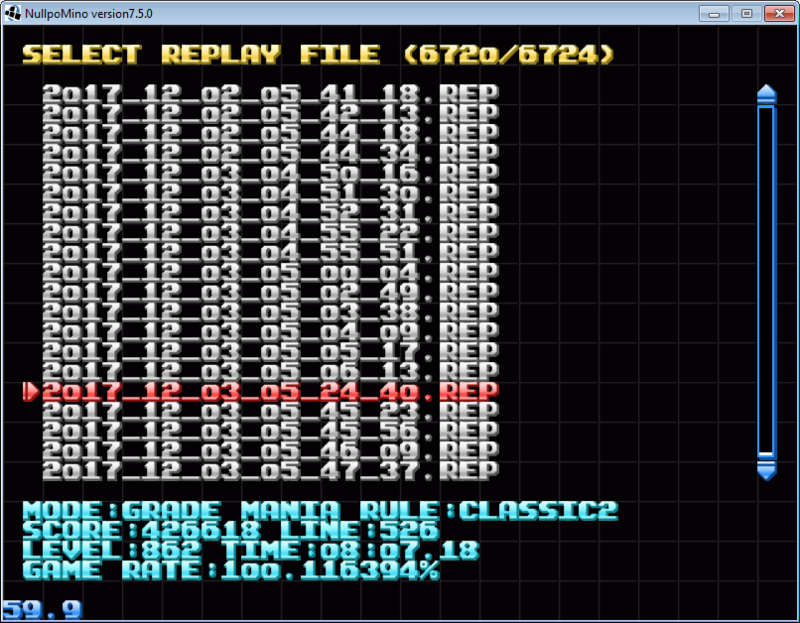 Yeah, I watched the rep... only counted 4 triples and no tetrises, so 854 would be the proper score. 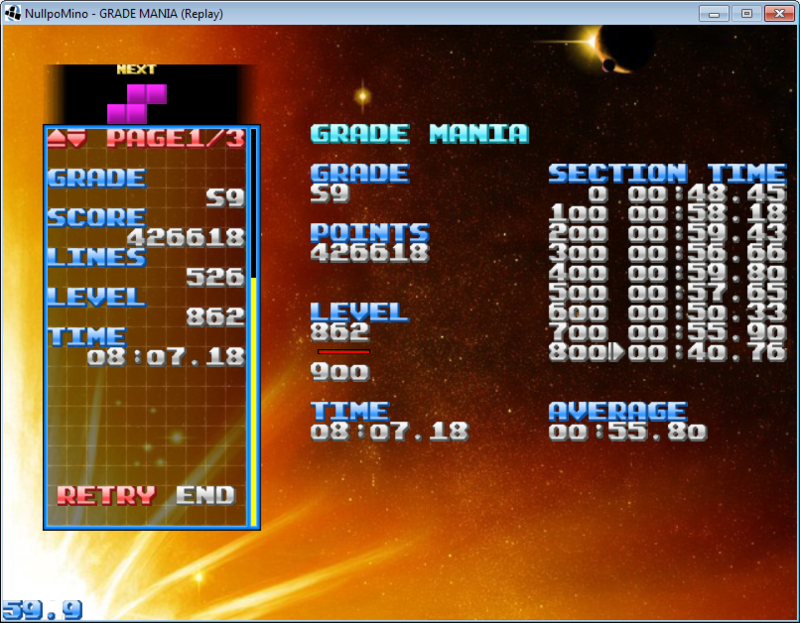 With the way I play big 20g, it's uncommon to get tetrises anyway (though I'm not actively avoiding them). 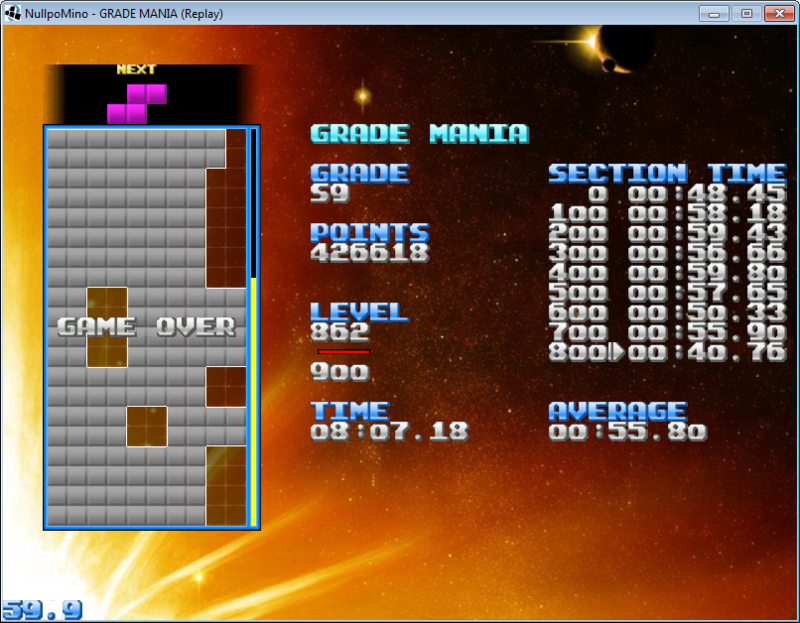 TGM might still be easier because some of the spawn placements are wrong in nullpo. Also got proper TGM set up now in MAME. Got it finally. 20G BIG MODE. Honestly, it was sooo much easier once I moved from nullpo to MAME. I think the input is just a little more responsive, but also the piece spawning makes a big difference. Does anyone know what the fastest recorded time for this is? I was going quite fast during this run but had to slow down for a couple sections. Kitaru, Shuey, simonlc and 6 others like this. Now I'm not the only one. Congratulations! I'll have to try to get it in 20G so we can compare times directly. Heh, sure! Maybe I'll try to time attack the non-20G mode. Have honestly not played it much since I figured I needed to get good at 20G to clear it so I just played 20G. Nice job Elyot! I didn't even notice this until just now (I wasn't subscribed to this thread with email notifications ). Also, shouldn't someone update the first post with Elyot's latest achievement?